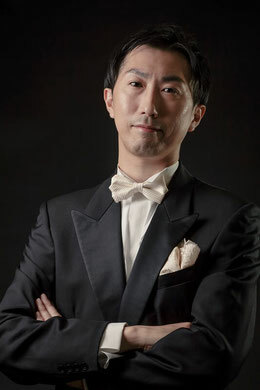 Yoshiharu WADA is a soloist and recitalist. Born in Fukuoka, Japan, he studied with Mamoru Kaishige. He graduated TOHO Gakuen College and TOHO Gakuen School of Music. He is the recipient of numerous awards and prizes including third prize of 41th Kamakura Music Competition for Students(Japan), achievement of performance at Totsuka Classic Concert(Japan), first prize of 6th International Competition for Instrumentalists and Comporsers “Music and Earth”(Bulgaria), first prize of the Audition for the Gaiety Theater Concert, SPRING(Japan), fourth prize of the 1st International SEILER Piano Competition in Japan, special prize of the 1st Yokohama International Piano Competition (Japan), and Grand Prix of the 1st Kurume International J.S.Bach Piano Competition(Japan). He completed Normandy Piano Course(France) and Academie International Musicales D’Ajaccio, then performed at the joint concert(France), and returned for solo recital at his home land(Kurume in Japan). He was invited by the festival “Arts for the Earth”, and performed at solo recital (Bulgaria), then it was maybe the first performance that Dutilleux’s Piano Sonata(all movements) was performed in Bulgaria. He annually performed at solo recital in YOKOHAMA Museum(’03~’05 in Japan). He performed with Krakow State Philharmony conducted by Roland Burder(’01,’02,’04 in Japan), TOHO Gakuen College Orchestra conducted by Hideomi Kuroiwa( Japan),and Yokohama Symphony Orchestra(Japan). Last year, he performanced with Concerts Eclatans Fukuoka Orchestra conducted by Naoki Tachibana at the Opening concerts of Kurume City Plaza, and Regular concert with Kurume Chamber Orchestra. He make an appearances at many solo and chamber music concerts in Japan, and studies with Jean-Paul Sevilla and the late Yuko Yamaoka. copyright © 2011 Yoshiharu WADA all rights reserved.